One of my cousins lives on the Eastern Shore in Maryland has a tradition of hosting a cookout in the beginning of July. This was the first year we’ve been able to go. 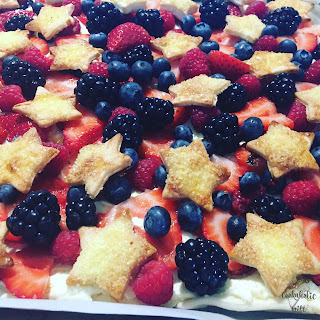 I knew I wanted to bring a dessert that was fitting for the fourth of July holiday and also large enough to feed a crowd. Insert the idea of a slab pie. First off, these are genius. You make a pie on a half sheet pan or jelly roll pan so it’s thinner, cooks faster and feeds a ton of people. I first made an apple version of one last Thanksgiving and considering our guest list for the holiday continues to increase, I think it’s going to become a yearly staple. I really liked this version of the pie because it requires minimal baking. 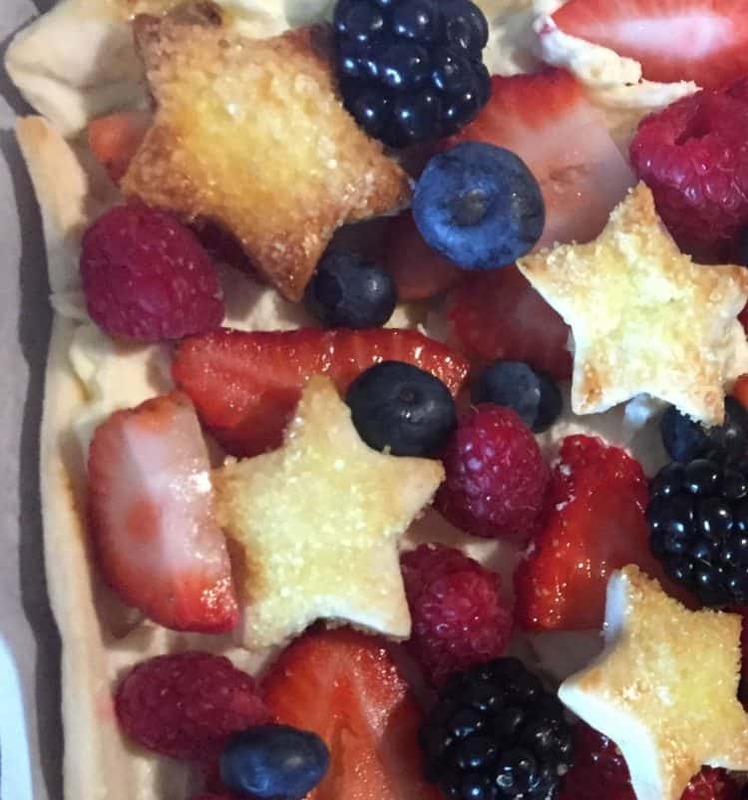 It’s actually pretty similar to fruit pizza if you’ve ever made one of those before. But why am I sharing it with you on July 7th, three days after the holiday? Now that’s a story. We came home on Sunday and I planned to get the recipe shared with you on Monday. Except, Comcast had other ideas. The weekend before we had a service call because we had terrible internet connection and couldn’t watch anything OnDemand in the evenings without it looking like when you flipped to a channel you didn’t get back in the 90’s. That tech determined our initial installation was done poorly and added an amplifier, but more importantly informed us that our underground line had a ton of noise in it likely because it was the original installed when the owner’s got cable a couple of decades ago. We were told we’d have service, albeit not great, through the replacement of the line. Upon arriving home Sunday, there was nada No internet, no cable, no phone. I called in and they pretty much told me they couldn’t help me because they needed an update from the dig crew who hadn’t contacted either of us since the prior Thursday. I’m told that I’ll get a call by Monday afternoon. Of course that came and went so I called in again and the rep was really apologetic, scheduling a tech to come out on the holiday to give us a temporary line so we’d have service. That evening I came home and found the red tube was next to the house, what we had been told meant the work was done. Except, still no service. So I kept the appointment and on Tuesday, the tech shows up and spends all of 30 seconds outside. The crew that installed the new line? Yeah, they didn’t hook up the service properly. One switch of connecting cables and boom, cable, internet and phone were back. 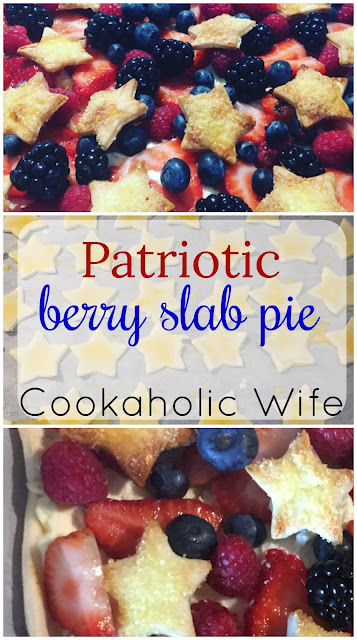 This easy patriotic pie made with fresh berries and prepared pie crust is sure to impress your friends and family. 1. Preheat the oven to 450 degrees. Line a half sheet pan and a large baking sheet with parchment paper. 2. Roll out two of the pie crusts to cover the half sheet pan. Prick with a fork to stop from rising too much. Beat the egg with 1 tbsp of water and brush lightly over the dough. Bake for 10-14 minutes or until lightly golden. 3. Roll out the remaining pie crust and cut out star shapes with a cookie cutter. Place on the baking sheet and brush with the egg wash. Sprinkle sanding sugar on top. Bake for 5-7 minutes or until golden. 4. Beat the softened cream cheese on medium speed until light and fluffy. Add in the lemon curd and mix until combined. 5. Allow the bottom of the pie to cool, then spread the cream cheese mixture on top. Refrigerate for 30 minutes. 6. Arrange the strawberries in rows, filling in between each row with blueberries. Fill in any gaps with raspberries and blackberries. 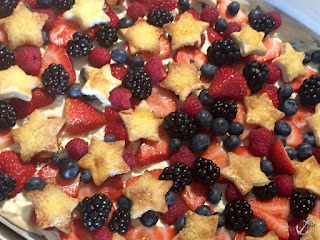 Press the cut out stars randomly on top of the fruit. 7. Refrigerate, covered, until ready to serve. 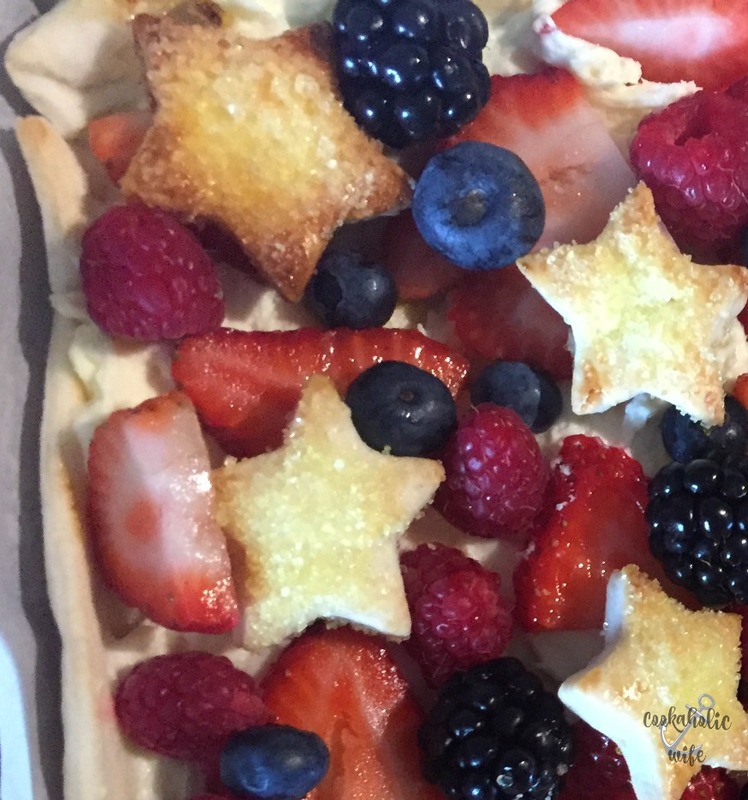 Since you only cook the crust and the topping, this pie can come together in less than an hour, depending on how long it takes you to cut up the fruit and cut out all of the stars. 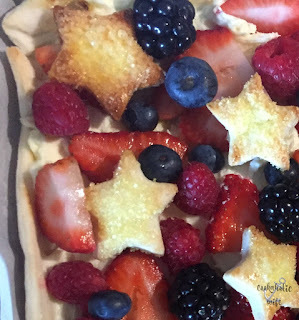 The crust is nice and flaky, the filling not too sweet and the berries being raw gives it the perfect amount of texture without soupiness that sometimes happens with cooked fruit pies. You can make the cream cheese mixture in advance, refrigerating it and then allowing it to come to room temperature to easily spread on the crust. The star cut outs can also be made 1 day in advance, being transferred to a sealable container once cooled.